A couple of days after seeing the Shihad doco on the weekend, which is well worth seeing for its own sake even if you have no interest in the band, I came across this revisiting of one of my favourite tracks of theirs, "Deb's Night Out", as well as another better known song (that I kind of have a love/hate relationship with). I knew the broad backstory to "Deb's Night Out" already, but I enjoyed the more detailed insights into just how it came to be. It's the song that finally got me into the band, after flirting with earlier singles. I remember hearing it on the radio sitting in a car in a supermarket carpark in 1995, hearing that looping melodic drone, the line about "pray for the rain, to wash you far away", the relentless drum sample that propels the song forward and I was hooked. It was perfect. In its more guitar based reworked live version it has become one of my favourite songs to see at a gig as well. The doco used the song brilliantly, cutting from live footage of it being performed last year to archival footage of the band's manager at an early 90's show. When released as a single it was packaged as an EP, with four other tracks, two of which are also favourites, the bulldozering cover of their then manager's band Flesh D-Vice's "Flaming Soul", and the gloriously moody and atmospheric instrumental "Last Day Of A Three Day Journey". I remember driving around in a car all night with a few friends in 1996, talking about loves and life, and playing this tape over and over until the sun was about to come up. 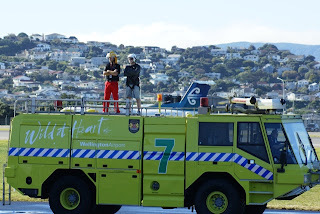 The video too is cool, capturing the conflict in the song perfectly (as well as some Wellington locations that are now either very different or gone altogether). I like it's unusual structure, and the way it presaged where the band was going creatively. It isn't only unique in style on it's album, it pretty much stands alone in their entire back catalogue. But it showed there was more to this band than just riffs and noise. It's dark, moody and uplifting at the same time, and I love it. Found this the other day and had a go. Apparently I am a fast reader (somthing I noticed at high school, when I once attracted an audience in class for reading this at about a page a minute when it was our study text), although I have no idea how the metrics for this thing are sourced, and it is advertising, so the whole thing might be bunk. I clocked in at 525 wpm, although I wasn't reading at full pace (the display and typeset took a couple of seconds to get used to, and I take a few pages to get warmed up anyway). Fun though. Also fun in the way of internet randomness was discovering I share my blood type with at best 1% of the world on average (I knew it was rare, but not that rare), and that as a type it didn't even exist until relatively recently (not seen until 1000-1500 years ago). For some reason it reminds me of the time I got 'made' for being Black Irish by an Irish doctor last year. 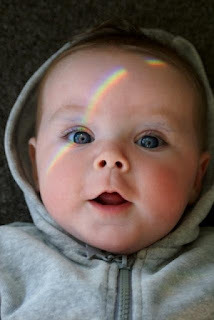 Solely on appearance (pale skin, very dark hair) he determined correctly I had at least some Irish ancestry. Since I have elements of Irish, English (and possibly Scandinavian given that part of England was prone to occasional tourism by the Vikings) that I know about in my ancestry, getting an ancestral DNA test done might be fun sometime. Finally getting around to posting some pics of the show itself. Rather than deluge a giant pic post, I thought I would try and go for theme or type posts. 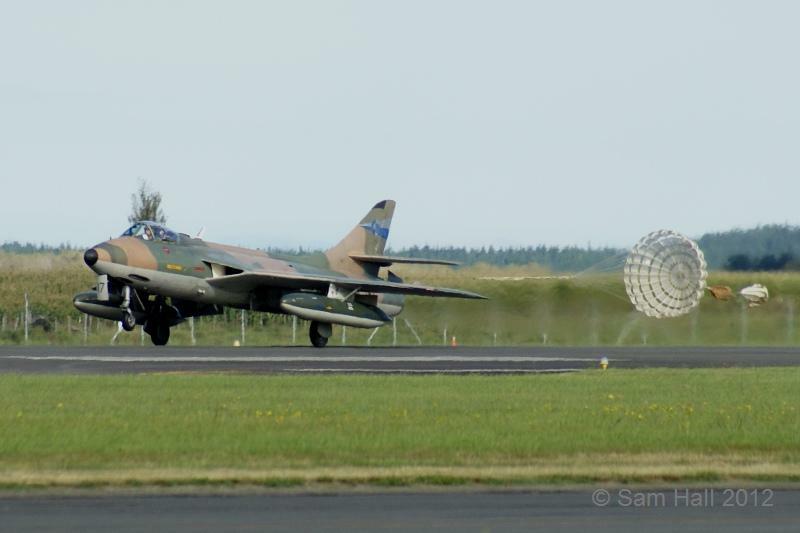 Since it opened the show, it seems only fair to start with the Hawker Hunter FR.74B. 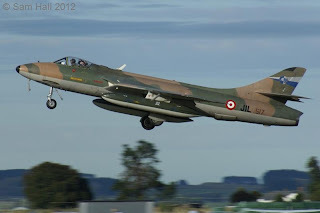 This isn't an RNZAF jet, but a civilian owned and operated jet warbird, which first started flying in NZ in 2000 before being grounded for cost reasons mid-decade (it's a high performance jet fighter, and thus not exactly cheap to run). 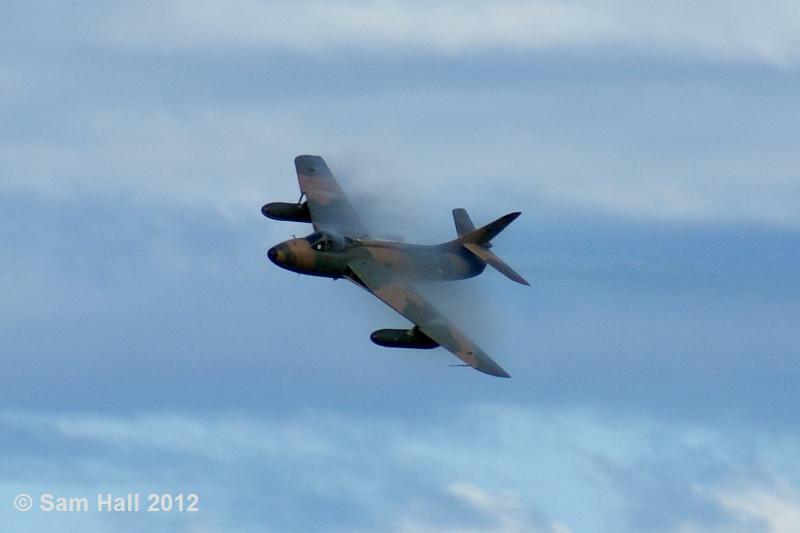 It was reactivated for this summer's display season, and it is great to see it flying again. The Hunter is a second generation jet fighter developed in the 1950's by the British, one of the best looking jet fighters ever built, and one of my favourite types. The RNZAF never operated Hunters, but New Zealanders did fly them on exchange with the RAF. 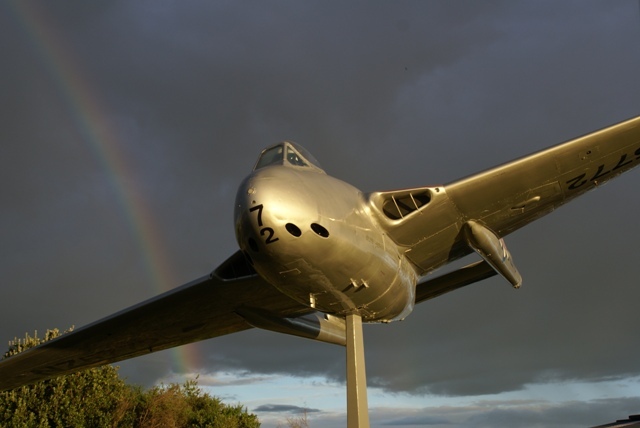 This particular one was built in 1957 and had an RAF career before being refurbished and having a second career with the Republic of Singapore Air Force, whose colours it wears now. The Singaporeans retired it in 1992, and it came here a few years later. Again would have been awesome if the light was a bit better, but them's the breaks. The streaks over the wings are cool, but I particularly like the little bit of ectoplasm sitting right above the pilot :). 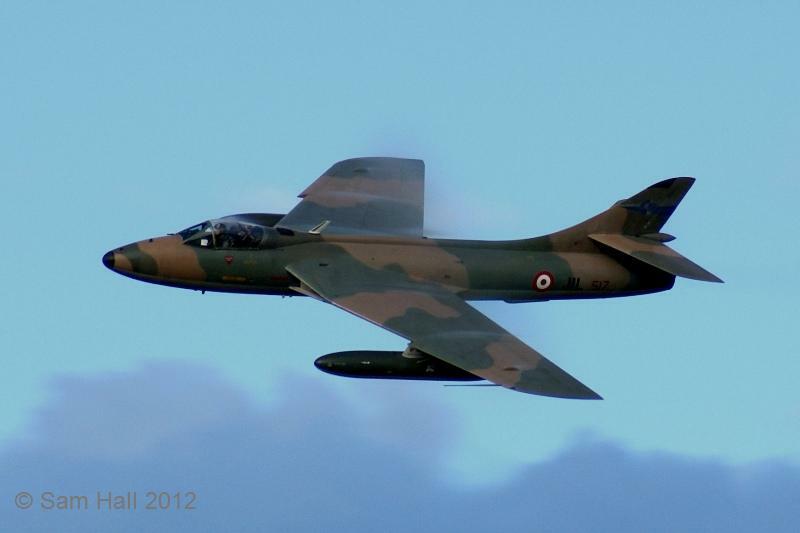 Like many high-performance aircraft of its era it uses a braking parachute to slow down after landing. I used to love seeing this jet at shows in the early 2000's, and hopefully we'll see it around for a few more seasons yet. It's fast, noisy, graceful and full of character. This is one of my favourite pieces of kit boxart (and aviation art in general), by one of my favourite aviation artists, Shigeo Koike, who in addition to painting exquisite aircraft portraits, has a long association with producing artwork for Hasegawa plastic kits. 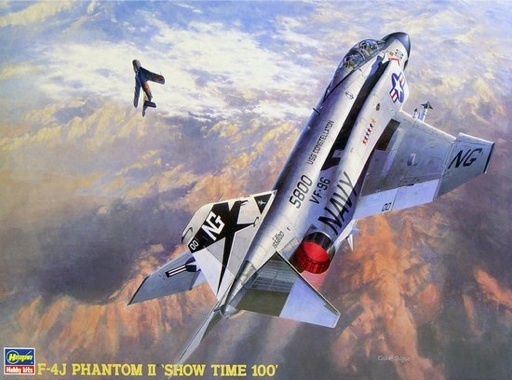 It might not be the most accurate depiction of the time and place, with another one here, but it is still a great painting (I like the incidental detail of the cloud in particular) and depicts the last flight of a US Navy F-4J Phantom, callsign "Showtime 100" on the 10th of May 1972 . At work we write all the dates dd/mon/yy as a convention for clarity, and I have nearly automatically written "10 May 72" instead of "10 May 12" a heap of times today since it is a date I have seen in print so often. 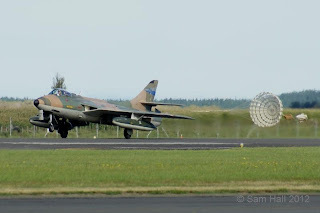 It's crew that day shot down three MiGs in one mission (becoming the first US aces of the Vietnam War), including an epic final duel against arguably the best North Vietnamese pilot any US flier would encounter throughout the war, before being shot down themselves by an unseen missile (the last battle against the well handled MiG-17 flown by a mysterious pilot also the subject of myth and lore is depicted in both paintings). Swiftly rescued they were back on their carrier the same day. It is one of the most analysed and discussed air combats in history, probably second only to the Red Baron's final flight. Forget the movie, this was real TOPGUN stuff, with their performance that day helping vindicate the formation of the then still relatively new and unproven tactics school that was created to address poor performances earlier in the war. Both of the crew were TOPGUN graduates, and would go become TOPGUN instructors, although one would subsequently fall from grace in a big way. It was the stuff of legends, and 40 years ago today (and only four years before I was born just quietly...). 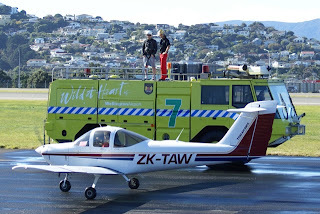 Yesterday might have been my wife's birthday (Happy Birthday to Fi, who also took all these photos BTW), but I got a great present in the form of participating in a winching demonstration at the Life Flight Open Day, after winning a radio competition a few days ago to play the role of sandbag/volunteer/item to be winched. 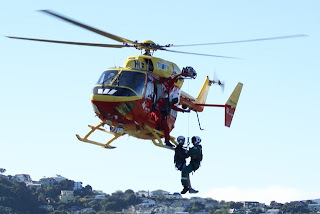 That's me with the paramedic on the end of the cable. The helmet helped, but it wasn't as noisy or windy as I was expecting, and they haven't dropped anyone yet, so I wasn't worried about falling. It was great fun; it honestly never occured to be to be nervous or anything. Watching the helicopter get closer and closer was cool, until it eventually blotted out the sun as it came to the hover about fifteen feet above me. Since the crewman's head is only about a foot away, and you're trying not to move around too much as requested (as well as enjoy myself, my main focus was to listen to the guys whose job this is, and not do anything dumb), you can't actually see much on the winch. I did have a surreal moment when we got level with the aircraft, and I looked down it's length and thought "Do you realise just where you are right now? 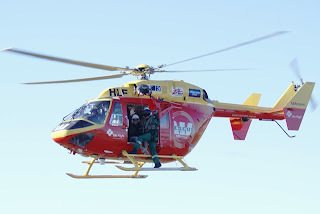 You're hanging outside a helicopter thats forty feet in the air!". It was cool. Safely retrieved we flew past the crowd, who were waving so it seemed only polite to wave back. 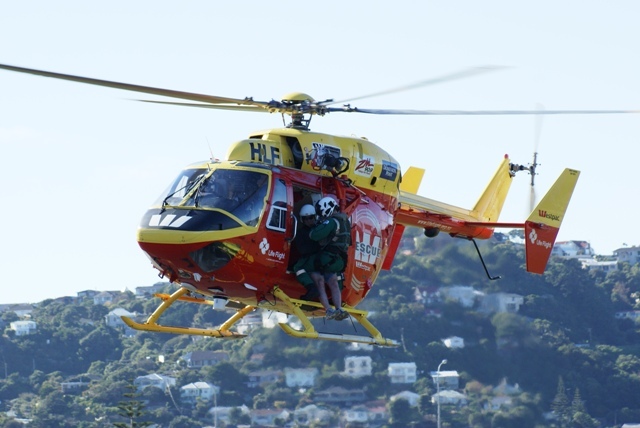 We then picked up a few more draw-winners and headed off for a flight around the city. Did I mention I was picked up from the back of a fire engine? Even more awesome points. So now I can cross being winched into an airborne helicopter off my to-do list. 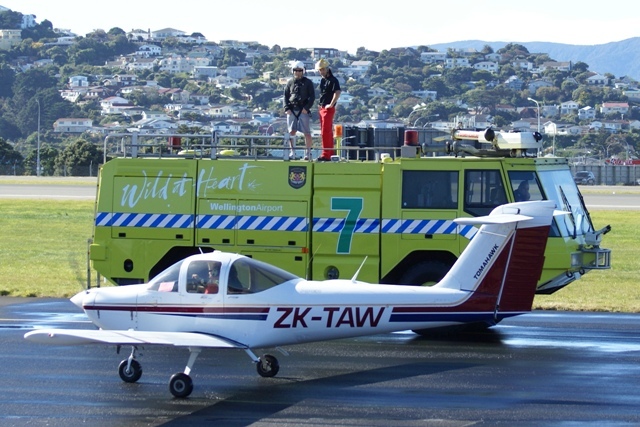 It was a privilege and a lot of fun, and thanks to everyone at the Life Flight Trust and Classic Hits who made it happen (hopefully circumstances like these are the only time I get to do this!). 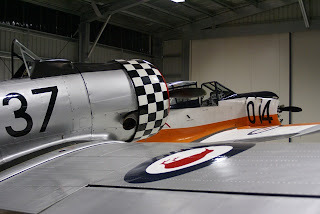 As I mentioned in the earlier post, on the night before the airshow I was lucky enough to be part of a group invited by owner/operator Brendon Deere to spend a couple of hours in a hangar on the base housing his personal collection of flyable historic aircraft. While we were waiting to be escorted on base, the recently refurbished gate-guardian Vampire FB.5 was looking good in the evening light. Dominating the hangar is the recently returned to NZ Grumman Avenger. This aircraft used to fly here in RNZAF colours before heading to Australia about a decade ago. It isn't ex RNZAF itself, but it represents the Avengers the RNZAF did fly in WWII and the years after. That's not an inspection hatch, it's an entry hatch. The Avenger is big, built around being able to carry a torpedo in an enclosed bomb bay, and enormous for a single engined aircraft. Comments about it's size on seeing one up close for the first time are quite common according to it's owner :). 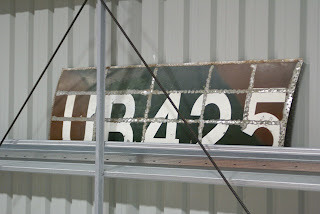 There is a legend that an entire fifteen man rugby team was once transported between RNZAF bases in one; looking at one up close it isn't hard to believe it might be true. 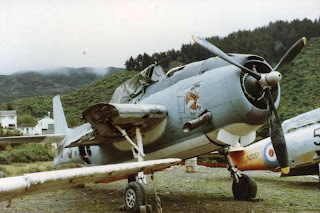 Having a look at this Avenger reminded me of the 1980's when I used to be able to go and explore a genuine RNZAF one near where I lived. 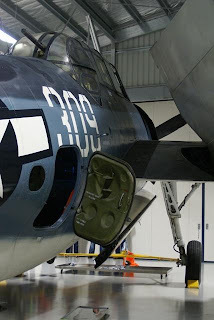 The wings were stored on the ground nearby, and you could see where the paint had worn to reveal the original US Navy markings applied when it was built in 1943. It was one of the first insights I had that these weren't just old aeroplanes; they had history and stories they could tell. 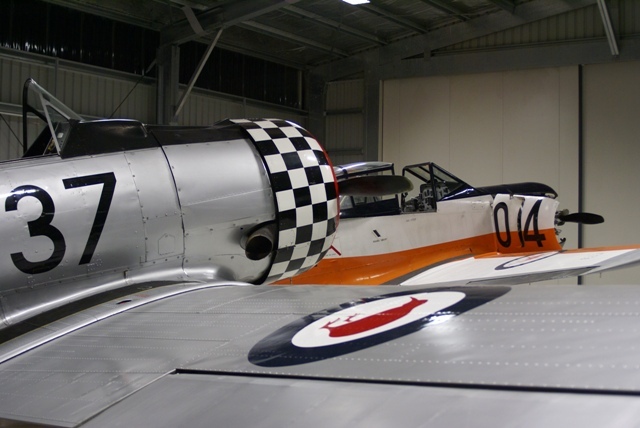 As well as the Avenger, the hangar is home to a pair of vintage trainers in the form of ex RNZAF Harvard, and Ex RAAF Winjeel. 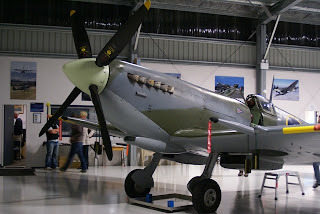 The highlight for many though, was the presence of Brendon's Spitfire Mk.IX. 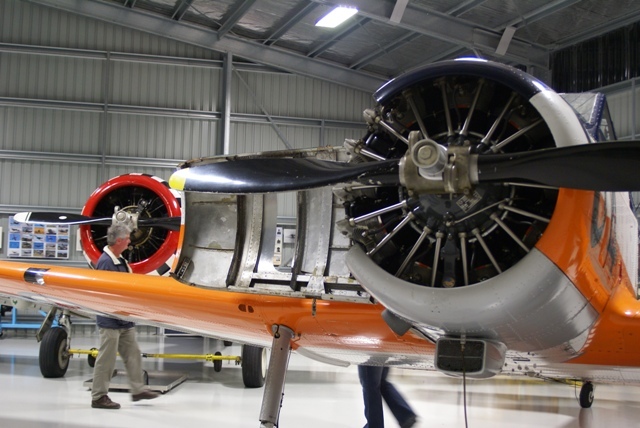 Brendon was responsible for bringing this aircraft to NZ, and completely restoring it to airworthy condition. 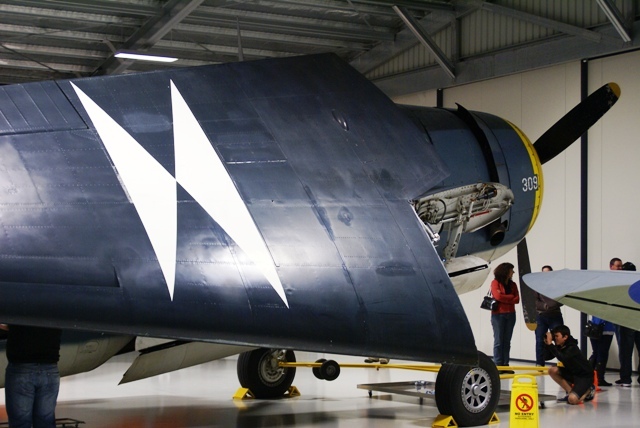 It wears the markings of his uncle Alan Deere, one of New Zealand's most well known WWII fighter pilots. 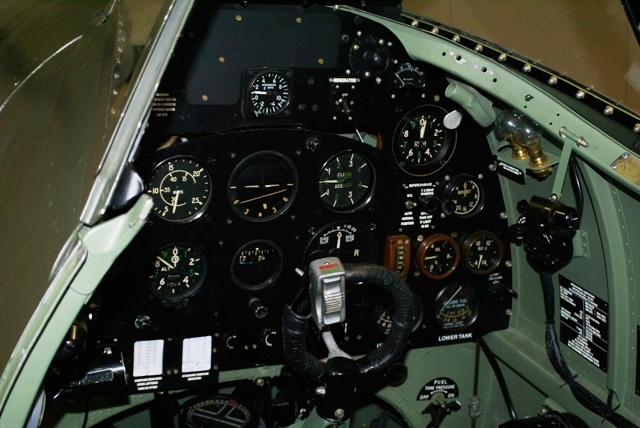 Like many surviving Spitfires, it has a varied history. Built in 1944, it served with the RAF, Italian Air Force, Israeli Air Force and Burmese Air Force before being retired in 1956. In addition to all the other displays and artwork around the hangar walls, a nice touch is an original section of PV270's skin, bearing the colours and serial it wore in Burmese service. 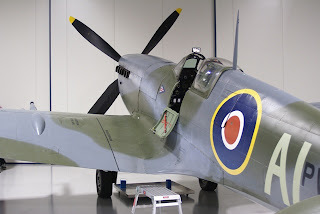 I remember reading about this particular Spitfire in a magazine as a child while it was still sitting on a pole in Burma. 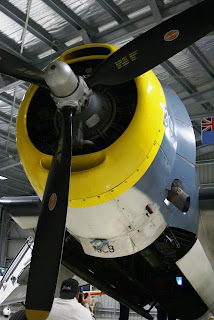 As an adult to be walking around it and inspecting it in my own country as a fully restored and airworthy machine was more than a little surreal, and an enormous privilege. If you could have told me back then I would spend an evening like this in the future I probably wouldn't have believed you :).